Happy St. Patricks Day! I hope you're all celebrating with hearty Irish food, Shamrocks and pints of Guinness. I visited Northern Ireland a couple of months ago in the bitterly cold November months and had a fabulous time learning about the culture and doing a few cake themed events with the charity Tearfund who I work closely with. We did events in different churches across NI in both Holywood and Portglenone, where I had the pleasure of meeting Ireland's-own bake off star Andrew Smyth's family. We raised a phenomenal amount of money (enough to provide 30,000 meals for hungry people!) and it was a privilege to be able to spread the message of Tearfund's amazing work and what needs to be done to make life better for those experiencing drought and famine. We have a few more Cakes, Bakes and Faith tour dates booked for this summer across the UK - follow me on Twitter for more information. Our next event is Kingston on the 22nd March, tickets are available here. I ended my trip with a tourist day up to the northern coast and visited Giant's Causeway and the Carrick-A-Rede Rope bridge - both absolutely breathtaking places. I'd thoroughly recommend spending time there and hope to go back (maybe in the summer when it is a little warmer!). The food in NI is divine and the people I met were so passionate about letting me experience the very best. I tried cinnamon scones (fresh and warm, dripping with butter! ), Hot Toddy, Potato Farls and Wheaten bread - all so interesting and different. My favourite was potato farls. Incredible, soft potato dough triangles fried in butter; what's not to like? 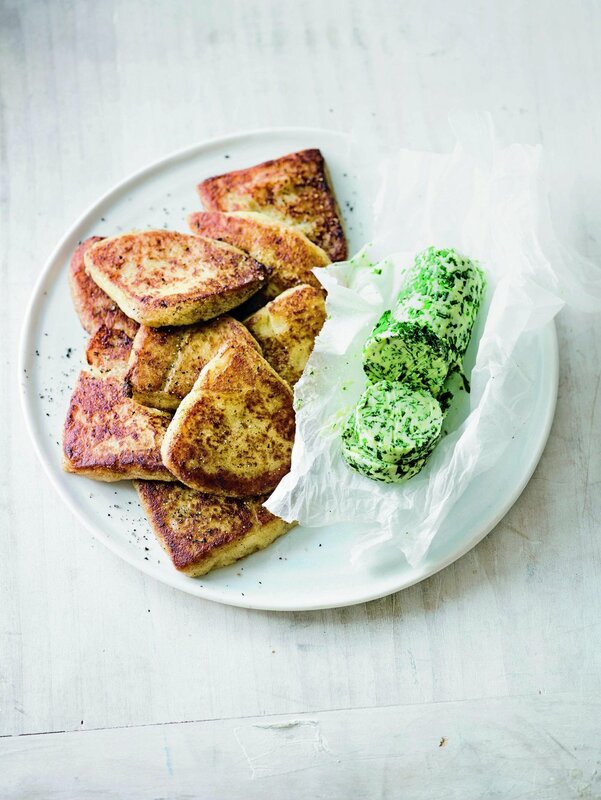 I've created my own recipe for Waitrose, served up with a green herb butter. They are super easy to make and go perfectly with a full-english or a bowl of soup. Recipe below or in the Waitrose Weekend paper this week (18th-25th March). 1. First make the herb butter. Beat the soft butter with the chopped herbs in a small bowl. Season, then roll up tightly into a sausage shape in a sheet of clingfilm and refrigerate until needed. 2. Meanwhile, peel the potatoes and chop them into small chunks. Bring a pan of water to the boil and cook the potatoes until they are tender – this should take around 10-15 minutes. 3. When the potatoes are soft, drain and allow them to air-dry in a colander for a couple of minutes. When dry to the touch, tip into a large bowl and mash the potatoes until no lumps remain. Add the butter to the mashed potatoes and mix until melted and combined. 4. Add the flour and baking powder to the potato mix, and stir until the mixture comes together as a dough. Season generously and stir again. Tip out on to a lightly floured surface and knead for 1-2 minutes until the dough is smooth and soft. Divide into 3 equal-sized pieces. 5. Roll each portion of dough out into a circle around 1cm thick and then cut into quarters. Melt a knob of butter in a large frying pan over a medium heat, then fry the farls, 4 at a time, for 3 minutes on each side or until browned and crisp on the outside. Repeat with the remaining farls. Serve hot with the herb butter spread liberally over the top.